A selection of our most recent projects. Each project, each client, is unique. Every website has been designed from scratch to showcase the right content for that client's needs. 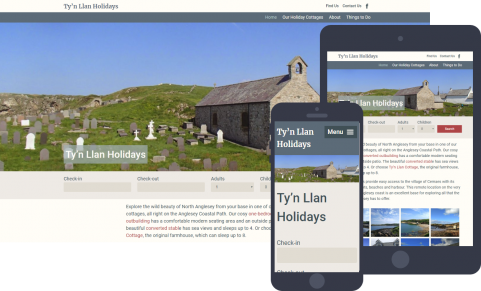 Ty’n Llan Holidays needed a new modern website that would work well on mobile phones and that they could easily update themselves. They also wanted to be able to take bookings directly through the website. The resulting site allows them to take deposits from bookings made directly through the website, add bookings taken elsewhere e.g. but phone, and see at a glance which properties are booked when. Each property has its own page with a selection of photographs, a full list of facilities and a detailed description. There are also detailed directions for how to find the properties and a guide to some of the local attractions. Cemaes Boat Club are the custodians of the classic lifeboat Charles Henry Ashley. They both maintain the boat and whenever possible sail it. The club wanted to update their old website, which contained lots of valuable information but which was not mobile friendly. They wanted a new modern look to help them attract new memebers and better advertise everything the club does. 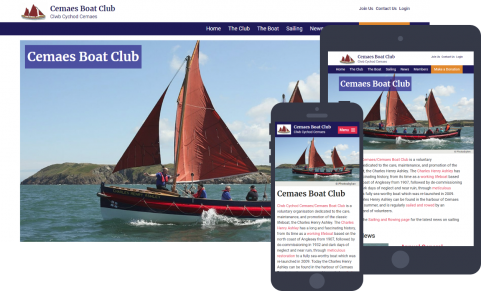 The resulting site takes it’s styling from the colours of the boat itself, and allows club members to log on and manage their own bookings on the various dates. Club officials can easily add and edit content, check that a sailing date has sufficient crew to be safe, and, if necessary cancel a sailing date altogether knowing that people booked on to that trip will be notified. We're delighted with this new look.... and many thanks to Janet Cross at 'Monality Web Design' for her IT expertise and skilful patient training. It is always an enormous pleasure to work with local people, and this project really couldn’t be more local, as the Treddolphin Guesthouse is literally round the corner from where I live and work. The new owners of the guesthouse, Celine and Ady, have worked amazingly hard to totally refurbish this important local landmark ready to re-open it for business this summer. I worked with them to design and build a dual language (French and English) website that reflected the simple elegance of the interiors they have created. The website is a simple one-page site with secure online booking, image galleries for the rooms and guesthouse, and helpful location maps. The actual design came together very quickly, the challenges were more ensuring that every aspect of this deceptively simple site was fully translated, all the time working with clients who, until recently, were still living and working in Singapore. The result is a mobile-friendly site that allows guests to book securely online without leaving the page, and allows Celine and Ady to manage their bookings and payments quickly, easily and securely. Creation of a website is a daunting and challenging task. But with the professional assistance of Janet from Monality, the process allowed us to work together in a relaxed manner. The result is a robust platform that is easy to navigate and yet is still a professional website that any business would be proud to own. Monality dealt with all questions in a very dynamic manner providing answers and/or guidance to each question within 24hours. 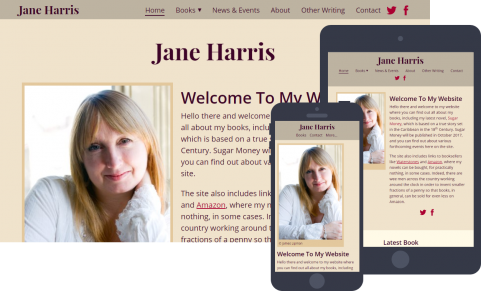 Acclaimed author Jane Harris needed a new, mobile-friendly website to help her promote her new book, ‘Sugar Money’. The resulting site uses a stylish but neutral palette to set off the covers of all her books, and allows Jane to share news and events. New news items are automatically also publicised on her social media accounts and appear on the relevant book page when appropriate, and events added to Jane’s Facebook page are automatically added to her website events calendar. Each book page provides clear information about the plot, provides a selection of links for buying the book, and also allows Jane to add background information, answer frequently asked questions, provide a book extract and show a selection of reviews. Thanks so much. I'm delighted with the website. 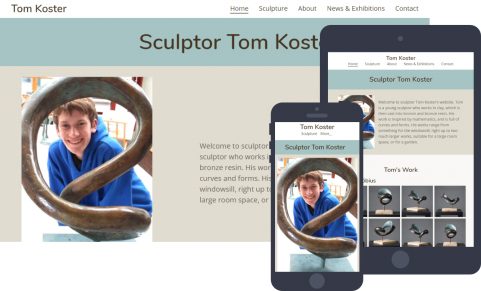 This was a really lovely project, as I got to work with an old school friend to build a website to showcase her son Tom’s wonderful sculpture. Tom is a very talented artist, already selling pieces through gallery exhibitions, and he needed an online presence to provide prospective customers and gallery owners with information about him and his work. The simple colour scheme helps set off the subtle patina in a lot of Tom’s pieces, and puts his sculpture centre stage. Tom's website looks fabulous, just what you need as an artist. Dealing with Janet was so easy, and the most straightforward contract I have ever seen. It was a real pleasure to work with Nicky and Russ to create a bright and attractive website for their new Bed and Breakfast on Anglesey. We love working with local businesses, and we designed a site that showcases their lovely rooms, provides loads of useful extra information about local attractions, and most importantly makes booking quick, easy and secure. Clients don’t get passed on to a payment gateway or a booking management site, everything happens right on the same page, giving a smooth and seamless experience. The simple booking form works equally easily on a large screen or a mobile phone, and the admin system makes it easy for Nicky and Russ to manage their bookings. Collaborating with Janet on our website was a positive experience. Janet was extremely patient and empowered me to take control so that I could manage the site once completed. That said, her support has continued since Go Live and she continues to respond promptly and proactively to any issues we have had since the site’s launch. 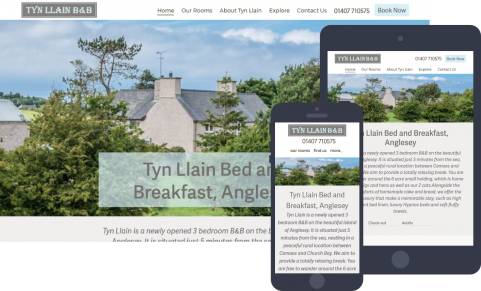 Tyn Llain B&B’s website is exactly what we had in mind, thanks to Janet’s skill and creativity. She listened to our ideas and turned them into an impressive website which does exactly what we need it to do. Susan Walton wanted a new mobile-friendly website to showcase her services in proofreading, copy-editing, re-writing and writing. 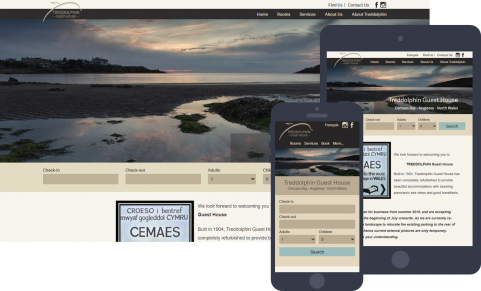 In common with many businesses in Wales, the site had to be completely dual language, English and Welsh. That meant everything – every button, piece of linking text, menu item – had to be in both English and Welsh with a simple language switcher to change languages. Fortunately, WordPress makes this relatively straightforward, and the result is a clear and easy to use website that functions beautifully in both languages. 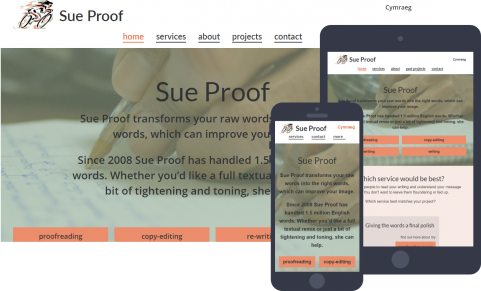 Sue Proof has found the path of creating a new website for her business smoothed and shaded by Janet Cross' readiness to solve problems and her endless patience and her flexibility. Janet was open to suggestions and explained everything, and she stopped me panicking. 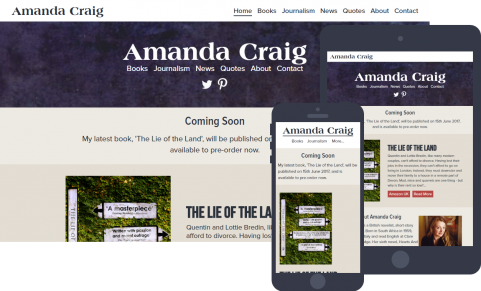 The brief from Amanda was to create a mobile friendly website to showcase her books and act as a resource for journalists who are writing about her. She wanted it to be clean, crisp and modern and be easy for her to update herself. We settled on a neutral palette to complement the wide range of styles of book-cover, personalised with a textured header inspired by one of her favourite Italian frescoes. Delighted with my website, many Tweets etc...thanks so much.